I’ve been looking for easy, homemade Christmas decorations. We haven’t amassed much of a collection and simplicity is important when you spend half your holidays out of town (as we always do)! 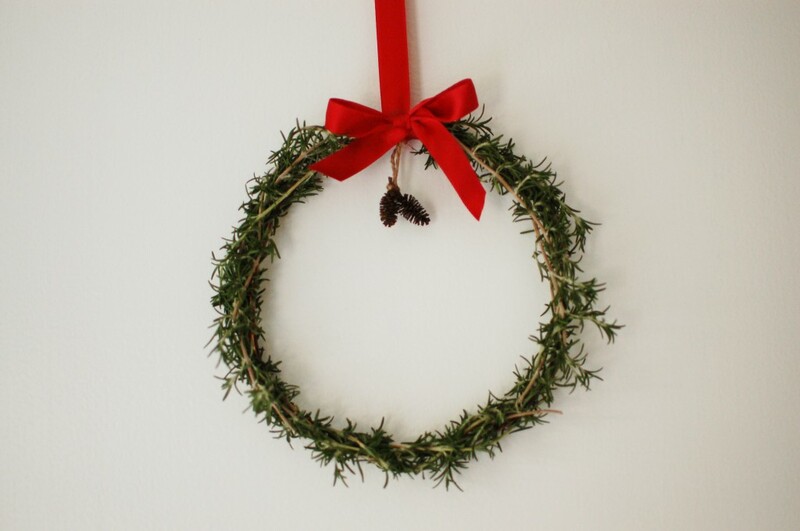 There is an abundance of rosemary in the garden here, so I made this mini wreath complete with mini pine cones (which I love!) for our door. It goes nicely with our super tall and skinny Christmas tree, and the fragrance is a great bonus! 1. 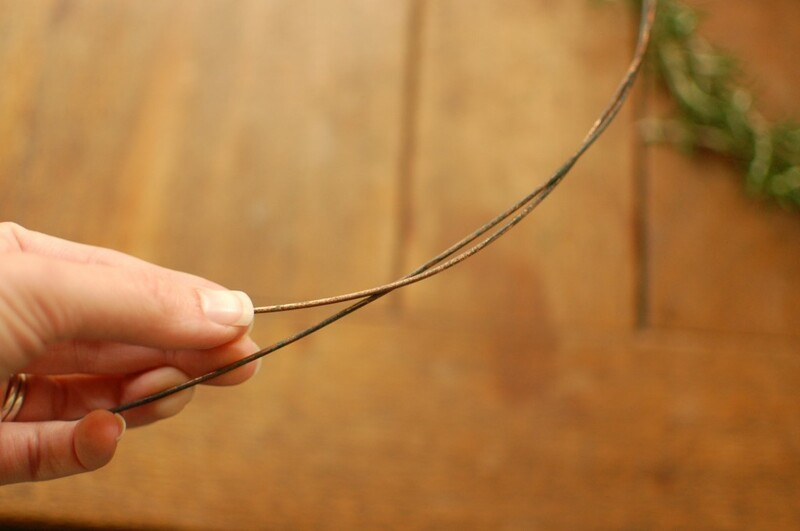 Bend wire in half. 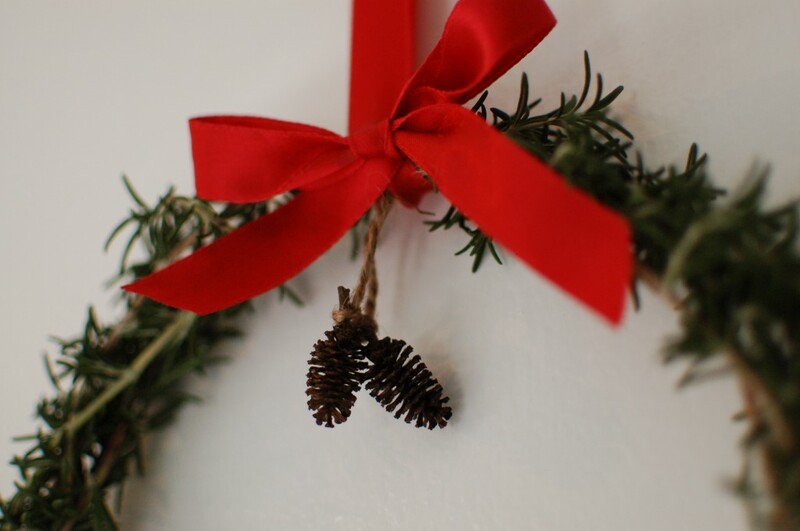 Twist the two strands around each other several times (this creates places to tuck the rosemary). 2. Wrap the ends together to secure the circle. 3. 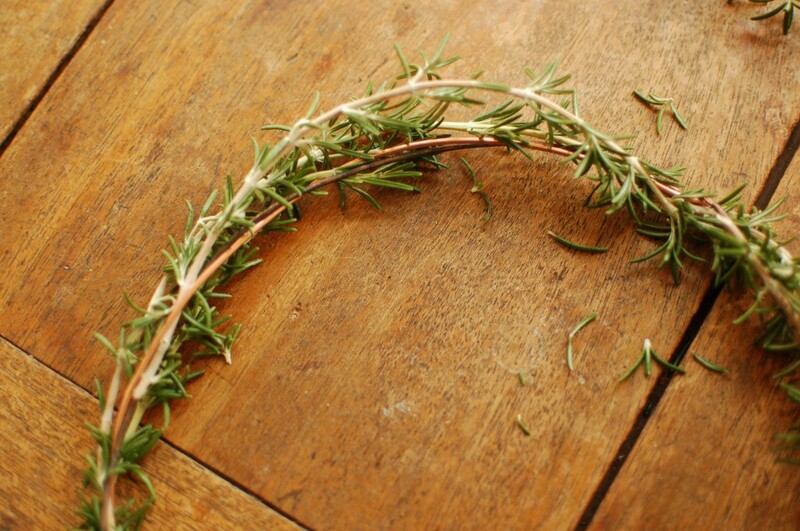 Tuck the ends of each piece of rosemary into the wire. 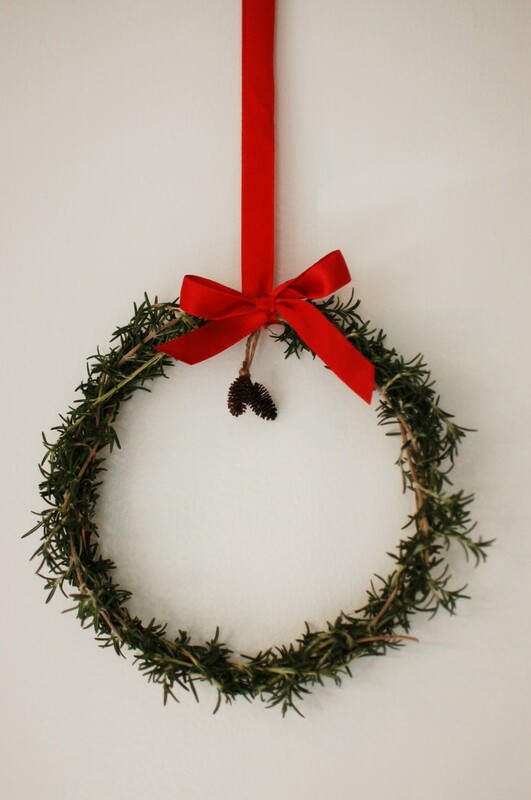 Occasionally, I’d also wrap the rosemary around the wreath a few times. (Sorry there aren’t really photos of this. Once I got going, I forgot to document!) The goal is a full and even wreath, hiding as much of the wire as possible. 4. I used a long piece of ribbon to attach the wreath to a hook on the back of our door, by essentially making a huge loop. Then I added the bow separately to the front and tied on the mini pine cones with twine. Customize to your heart’s content! it looks very cute and i bet it does smell good! Pretty! I love this idea. I don’t have much (umm…any!) Christmas decorations, and I love the simple beauty of this project. This is such a great project. I just finished making a “kissing” ball made of rose petals which hang nicely. It took me about ten minutes to make and it reminds me a lot of this! We tried this over Christmas time; it was cute, however, pretty intense when the wire is too thin Thanks for the idea! I always love mooching off your creative ideas. I always give you guys credit though! Yes, it is really hard when the wire is too thin! 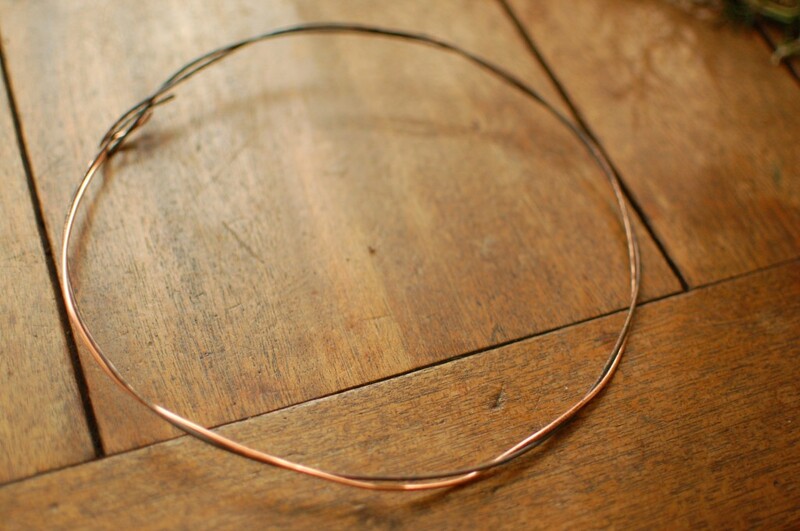 I tried thin wire first, but couldn’t get it to hold the circle shape. 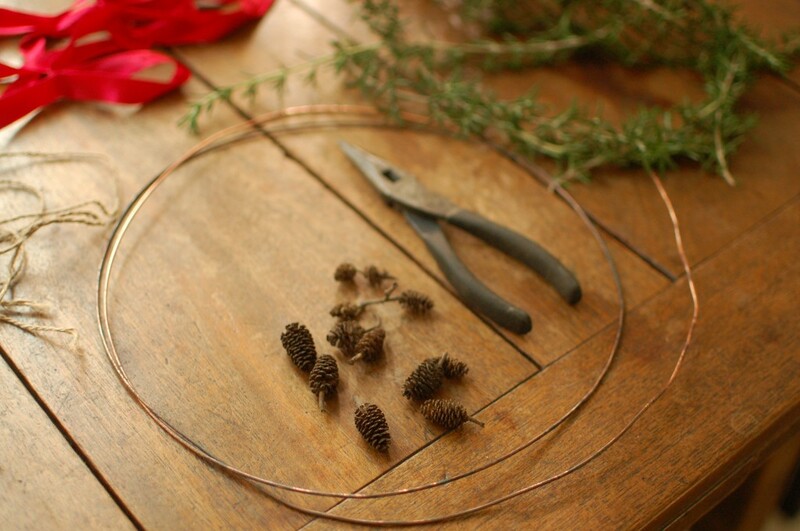 You can also skip the wire and braid the rosemary, starting with long pieces and gradually adding new pieces in. That was my backup plan before finding thicker wire! How long does the the rosemary remain green and how long does the fragrance last?